On March 12, President Trump signed the public lands bill— formally known as S. 47, or the John D. Dingell, Jr. Conservation, Management, and Recreation Act, into law. 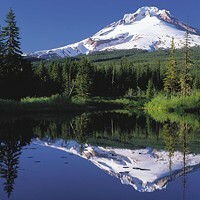 The Act, formerly known as the National Resources Management Act—includes the Oregon Wildlands Act. Included in this large piece of legislation was a new wilderness designation for Oregon's Devil's Staircase Wilderness, a more than 30,000-acre swath of public land southwest of Eugene. Also included in the Act: help in battling wildfires. Steelhead Falls on the Deschutes River is one place that still needs permanent protection, according to the Oregon Natural Desert Association. The Act also affords improved flexibility for hazardous fuels reduction for places including Crooked River Ranch, the unincorporated community of about 5,500 people in Jefferson County. On Nov. 8, the deadliest wildfire in California's history started near the town of Paradise. By the time it was finally extinguished, it had killed over 85 people and caused over $16.5 billion in damages. The area the fire burned through has an eerie similarity to the area near Crooked River Ranch: grasses, steep canyon lands, dry fuels including juniper trees and low humidity. Part of the land adjacent to CRR is managed by the Bureau of Land Management and is part of the Deschutes Canyon—Steelhead Falls Wilderness Study Area. In working on the public lands bill, Sen. Ron Wyden (D-Ore.), Sen. Jeff Merkley (D-Ore.) and Rep. Greg Walden (R-Ore.) helped create a provision that would release a small number of acres from the Wilderness Study Area, giving the BLM more flexibility to reduce hazardous fuels near the ranch, according to a statement from Wyden's office. The Act also prevents off-road vehicle use in the released lands to further limit wildfire risks. 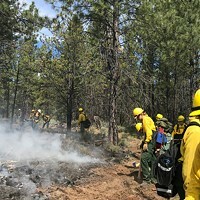 Carl Harbour, president of the Crooked River Ranch Club & Maintenance Association's board of directors, said having a wilderness study area adjacent to a subdivision of 2,644 property owners is counter to managing fire safety. Harbour said the release of the 688 acres from the study is a huge step forward in reducing fire threat for the CRR community. "The HOA Board of Directors was in full support of the Bill, and looks forward to the federal agencies creating management plans, then funding and implementing fuels reduction actions in the very near future," Harbour wrote in an email to the Source. "In addition, every property owner is encouraged to improve their own 'fire safe' practices and property improvements." The Crooked River flows through the high canyon walls near Crooked River Ranch. Harbour underlined that last part, saying everyone has to participate to cut down on fire risk. "I think it is short-sighted and unrealistic to think that the protection of your property, animals and family members is solely the responsibility of other people or organizations." Harbour also pointed out how other changes, such as a new exit/entry to CCR, paved out last fall, also help. "This helps response time from supporting local agencies and a second exit option for us if evacuation is needed.," Harbour said. "Being prepared is never ending." Oregon's congressional delegation is calling the passage of the bill a major win—though some say more work needs to be done. "These significant steps to reduce the danger of wildfire at Crooked River Ranch were the product of what I call the 'Oregon Way'—listening to residents about the comprehensive approach they wanted to address their local concerns," Wyden wrote in an email to the Source. "I am gratified that the hard work to pass the public lands bill contains the protections for Crooked River Ranch as well as major safeguards for Oregon's natural treasures like Devil's Staircase and 250 miles of additional wild-and-scenic river designations." Gena Goodman-Campbell, public lands coordinator for the Oregon Natural Desert Association and a Bend city councilor, said the public lands bill has a lot to celebrate in it, including the fire risk reduction at CRR, the creation of the Devil's Staircase Wilderness and additional safeguards for Oregon's rivers (see sidebar – "Wild About Rivers"). "One of the most significant things is the permanent authorization of the Land and Water Conservation Fund," Goodman-Campbell said. "So that helps fund the protection of public lands and waters and it's a really great tool for public lands protection." However, Goodman-Campbell said she believed there were things left out of the bill—like protections for public lands in Central and Eastern Oregon. One of those projects is protection for the Owyhee Canyonlands—the largest area of unprotected lands in the lower 48 states. "It's just incredible," said Goodman-Campbell, who floated the remote river in 2017. "It's just one of those places you think, how is this not protected? How is this not a national park?" The Owyhee Canyonlands is located in the far southeastern portion of Oregon. It's carved out by desert rivers winding toward the Pacific Ocean, with craggy red-rock canyons, blue-ribbon trout streams and rolling hills making up a diverse wild land nearly the size of Yellowstone National Park. "Its remoteness is one of those things that makes it so special and it has protected it somewhat in the past," Goodman-Campbell said. "But it really is facing increasing pressures from everything from natural gas exploration and mining to fire and illegal off-road vehicle activity." Another project for ONDA, closer to Bend, is better protection for the Whychus Creek and Deschutes River area near CRR. "In places like Steelhead Falls and on Whychus Creek, we see a lot of vandalism, including anti-Semitic graffiti and destruction of cultural sites," Goodman-Campbell said. "There's a lot of out-of-control off-road vehicle use with people harassing wildlife and trespassing on private lands and dumping trash on public lands, including a car that was recently abandoned on the peninsula north of Crooked River Ranch." Part of the challenge in managing the Deschutes/Whychus Creek area is that it's managed by a conglomerate of government agencies: The BLM and the United States Department of Agriculture, which operates the U.S. Forest Service, which in turn controls the Crooked River National Grasslands. "One of the reasons we feel (more protection) is so important is to have those agencies to have better guidelines on how they can address these issues out there," Goodman-Campbell said. The 10-year anniversary of the Oregon Badlands Wilderness and the Spring Basin Wilderness is March 30. Goodman-Campbell said ONDA is pushing legislators to help address issues happening at Whychus/Deschutes. "It's a small area, but it has a lot of pressure on it from being in the middle of a very developed area and in such close proximity to all of the Central Oregon population centers," Goodman-Campbell said. "It's so gorgeous and it's amazing on how wild it still feels being so close to civilization," she continued. "You step down into that canyon and it's just amazing that you can feel like you're the only person that's been there for years. "It's still amazingly wild, and we want to keep it that way."